This is the picture I saw in my head, I was able to find just what I was imagining on a google image search. Now my mind is spinning with ideas to create ethereal shapes of soft colors against a midnight backdrop. 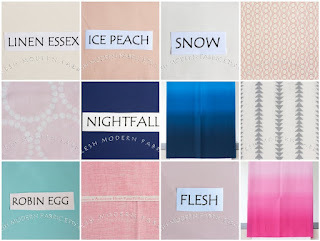 Are you loving those ombre Kinkame fabrics from Fresh Modern Fabric? I can't believe I've never seen them before! So go make a mosaic and maybe you can win a fat quarter set of your mosaic fabrics. Incredible, Courtney! I'm so glad you posted about your inspiration. Hey girlie. I tried to respond to your comment on my blog, but looks like you are a no-reply blogger. Freaking Google did that to me too not too long ago, so I thought I would let you know.